What Day Of The Week Is October 8? 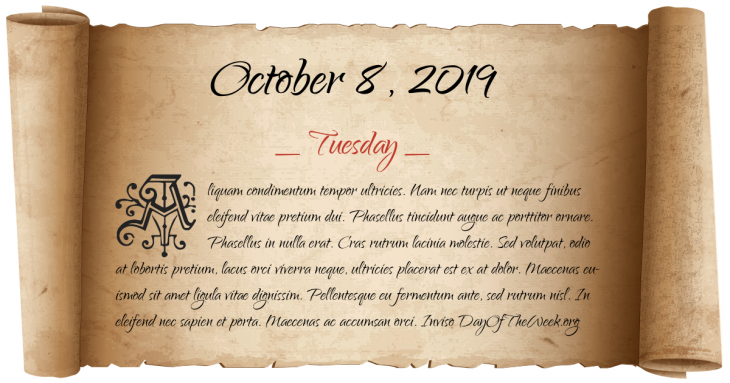 October 8, 2019 is the 281st day of the year 2019 in the Gregorian calendar. There are 84 days remaining until the end of the year. The day of the week is Tuesday. First Balkan War begins: Montenegro declares war against Turkey. World War II: In their invasion of the Soviet Union, Germany reaches the Sea of Azov with the capture of Mariupol. Greek military junta of 1967–1974: Junta strongman George Papadopoulos appoints Spyros Markezinis as Prime Minister of Greece with the task to lead Greece to parliamentary rule. Oslo’s Gardermoen airport opens after the close down of Fornebu airport. 2005 Kashmir earthquake: Thousands of people are killed by a magnitude 7.6 earthquake in parts of Pakistan, India and Afghanistan. Who were born on October 8?